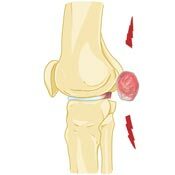 A Baker's Cyst is a swelling on the back of the knee caused by the build-up of fluid inside sacs called bursa between the two heads of the calf muscle. The symptoms are usually mild unless in the rare situation the cyst bursts or extends down the calf muscles. A Baker's Cyst is also known as a popliteal cyst. 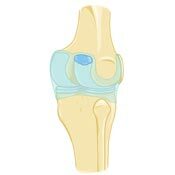 The knee is a hinged joint between the thigh bone and the shin bones. The entire joint is enclosed inside a tough capsule lined with a membrane and filled with lubricating synovial fluid. Extra capsules or sacs of fluid, known as bursa, cushion the joint and help reduce the friction between tissues caused by movement. 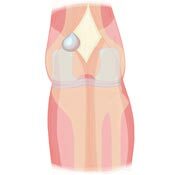 When the knee produces too much synovial fluid, the excess fluid causes the bursa behind the knee to expand and bulge. 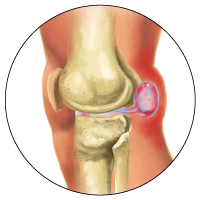 Common causes of Baker's Cysts include arthritis, infection, torn knee cartilage and other knee injuries. A small Baker's Cyst is generally painless, but as a cyst grows larger it can cause stiffness and pain behind the knee. Patients often complain of a feeling of tightness behind the knee when it is flexed past 90 degrees or a pulling sensation when the knee is straightened. If the cyst ruptures, it can be quite painful and produce a bruised area on the back of the knee and calf. A person may be less inclined to seek medical help for a Baker's Cyst if the symptoms are mild, which they generally are. 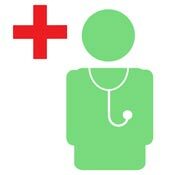 However, it is important to seek medical advise, as more serious but less common problems can present in a similar way. These could be a tumor, deep vein thrombosis or a popliteal artery aneurysm.